New National Wetlands Inventory Layers Released! The new 2015 National Wetlands Inventory layers have been released! This includes both an imagery layer and a map image layer. The layers can also be seen in this web map. These layers are available through the Living Atlas of the World on ArcGIS Online. 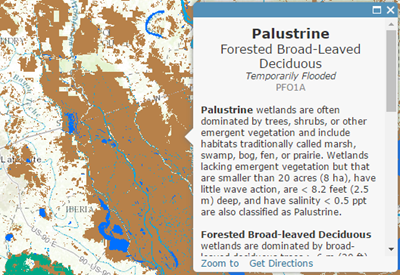 The pop-ups for each layer have been vastly improved and now include wetland classifications such as the system, subsystem, class, subclass, code, and even typical species where information is available. Water regime modifiers, special modifiers, water chemistry modifiers, and soil modifiers are also part of the pop-up and available as attribute fields. Wetlands provide a habitat for plants and animals while regulating water and building soil. The information contained in these layers is valuable to land use planning and efforts to conserve wetlands. This layer can be used alone or with other layers from the collection of landscape layers to complete a wide variety of mapping and analysis tasks, and the Extract Landscape Source Data tool can be used to download the layer’s source data. The Living Atlas of the World is the authoritative, curated, ready-to-use content available throughout the ArcGIS platform. Contributed user and partner content, along with Esri content, compose the Living Atlas. This content can be used alone or in conjunction with additional data to help you complete your work more efficiently. To learn more, please visit our website and follow us on Twitter.